In the second part of the A to Z of Becoming, Z stands for the verb, zoom. What I suggest you do with this verb, is think of a camera lens – the kind that zooms – it can zoom in, and it can zoom out. 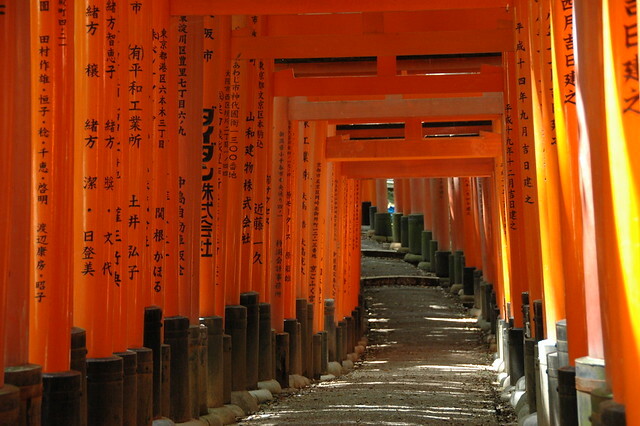 A few years back I climbed the hill to the Inari Shrine just outside of Kyoto. I took photos (of course) and what follows here is the sequence, starting at the entrance gate, then looking back towards the gate, and beyond to Kyoto, as I climb the hill. See if you can pick out the entrance gate in all the photos. Imagine now, that you are standing on top of this hill, and you zoom in on the gate you passed through at the start of the climb. You can either do that using a camera lens, or you can do it using your memory or imagination. As you zoom in, and zoom back out, the context changes. You see what you saw before but in a different, broader, or narrower, setting. That’s what zooming does for us. It allows us not to get stuck on one single viewpoint, but to see whatever we are looking at in a number of different contexts. You can do the same with time. You can stand here, at this point in the year, today, this very day, and zoom out to remember or imagine this day in the context of this week, of this month, of this year, of this life even. Then zoom back in again, to focus on the present. Can you do that to see forward as well as back? You can, if you use your imagination…..
– where you can’t zoom very far forwards, or backwards, you can only see as far at the next curve, and as far back as the last one – keeps you focused on the here and now! It’s good to focus on the here and now, but a bit of zooming can broaden or deepen your awareness.